A Distinguished Club, Eight Years in a Row -- Now President's Distinguished! We are the main local chapter of Toastmasters International, the "funnest" and most cost-effective way to learn and practice communication, public speaking, and leadership in Fairfax, Virginia! Started in 1924 in a YMCA in California, Toastmasters now spans the globe, with over 345,000 members in over 15,900 clubs in 142 countries. 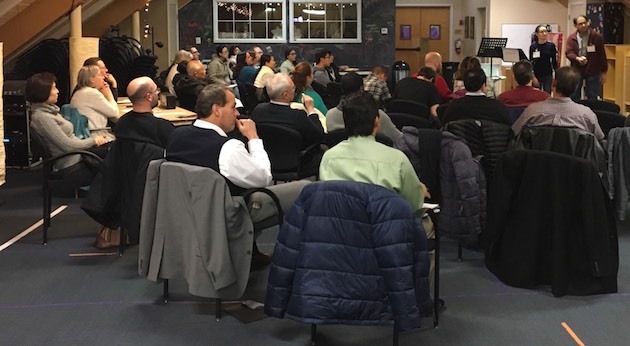 Though Toastmasters started in a YMCA, and Fairfax Toastmasters meets in a church, we are not a religious organization -- people of any faith (or none), race, ethnicity, national origin, etc. are welcome. (In fact, if English is not your first language, this is also a great way to practice it!) The only restriction is that you must be at least 18 years old to join. Our training will enhance your communications and leadership skills. That may not sound like much, but think about it -- you use these every day, when you interact with your customers, colleagues, kids, or pretty much anybody! It will enhance your self-confidence, as you learn to think on your feet and not get flustered. These skills can enhance your career and your personal life. We offer a friendly, supportive, diverse, laid-back atmosphere. We let you proceed at your own pace, with no grading, and no flunking. We have an active mentoring program to make sure you get the one-on-one attention you need. But most of all our group is fun! We hold meetings -- but not boring droning meetings like at work! We hold fun, fast-paced, productive meetings! We take turns in different roles such as Speaker, Evaluator, Table Topics Master, or Toastmaster of the Evening. We learn valuable lessons in communication and leadership from the feedback we receive -- including on the feedback we give. We also take officer positions, hold contests, and put on other special events. FOR THE MONTHS OF APRIL THROUGH JULY 2019, we will be meeting in a room on the ground floor, instead of the upper room. To get to THIS room, instead of going up the stairs, turn left, it will be the first room on your right, opposite the glass wall to the outside. See below for the directions to the stairs. We usually meet in the Upper Room of Truro Church, at 10520 Main Street, Fairfax, VA. Free parking is available in the church lot. To find us from the lot, go into the glass-walled covered walkway between the main church and the school building. Turn left. Enter the school building. Go up the stairs, and through the double doors. Sometimes we meet in other places, some also at Truro Church but some not. Check the individual meeting to be sure... and even then, we might get moved without ability to update the web site. We meet on the first, third and fifth Thursday of each month from 7:30 to 9:00 PM. We start promptly at 7:30, so please try to arrive at least five minutes early to get settled in. Second, just like with a gym, simply joining won't do anything for you. You have to actually show up and participate and put in the effort to get much benefit! You get out of it what you put into it. You will be expected to pull your weight, by speaking, taking other meeting roles and officer positions, helping with events and projects, and more. Come to one of our meetings and check us out -- see the "Next Meeting" box on the right side of this page. For more information, call or text us at (571) 20-TALKS (571-208-2557), or contact our VP of Membership using the info in the "Home" box on the left side. If you're already certain you want to join, you can download and fill in a membership application.